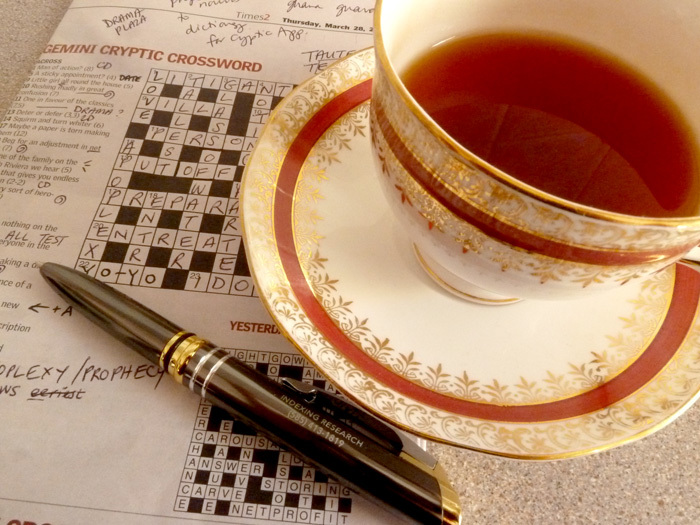 Here we go again, my analysis of the clues in The Canberra Times' Gemini cryptic crossword. This is the one published on Thursday March 28th 2012. The definitions are underlined (except in double definition and cryptic definition clues). Cryptic definition. Someone who takes legal action is a LITIGANT. Double definition, cryptic definition. A DATE can be an appointment, and it's also a sticky fruit. Abbreviation + reversal. Little girl = VI (yeah, I know, it could be any two-letter short name for any girl's name! Not that fair.) + LLA (all run round, or backwards). Anagram indicated by confusion, the fodder is in great. Cryptic definition. This one was hard! While we're familiar with the term 'persona non grata', this more positive variant is not well known. It means "a person, especially a diplomat, acceptable to certain others; an acceptable person." So they can be said to be one in favour. Of the classics refers to the Latin origin of the phrase. Double definition. PUT OFF can mean to deter someone, and can also mean to delay or defer an event. Anagram, indicated by turn. The word to muddle up is whiter. Anagram of net rate, indicated by an adjustment in. Homophone clue, indicated by we hear. NICE is a city on the French Riviera, and it sounds the same as NIECE, who is one of the family. Cute deletion clue. You endless = YOU - U = YO. Then repeat it! Anagram of dilatory, indicated by sort of. Cryptic definition. LOVE is the word used to describe a score of nothing in tennis. You may also imagine that on some tennis courts there is no love between the players, LOL. Anagram. The fodder is lower gas fast. The indicator (of sorts) is making. Which to my mind reads more as a linking word than an anagram indicator. Charade. Absence = NO + ring (as in the sound, not a piece of jewellery) = TING. Reversal and charade. Tina comes up = ANIT (Tina written in reverse) with a = A = ANIT+A. Double definition, with a coined meaning. In the tomb could possibly be written as EN-GRAVED (put in a grave). And tomb inscriptions may be ENGRAVED. Cryptic definition. You really need to have some crossing over letters in the crossword grid to get a way in to this one. But it's fair to say that a DANGER SIGNAL cannot be safely ignored. I think this is a cryptic definition, but admit that I don't have a very satisfactory explanation for the answer, apart from APOPLEXY being a dated definition for a stroke, and having a stroke possibly being the worst misfortune. Container. Another use of TEST in a clue (see 2 Down!). In this clue TEST is clued as trial. Points = ENS (or NSE), compass points. They are witnessed in or put inside TEST. T(ENS)EST — or TE(NSE)ST. Double definition, as very short clues often are. If you left someone, you PARTED from them. And if you PARTED the shrubbery, for example, you divided it. Double definition, the first definition is A record, as in a record or ENTRY in a database. The second definition is number of contestants in the field, the singular noun is used to describe the number of competitors in a race. Hidden word. An important part of indicates the hidden word. The answer can be found within eVERYthing. I have to say this each time just in case someone from the Canberra Times who cares stumbles across this blog entry: this Gemini crossword is awful. 17-across isn't an &lit although I think it is an attempt at one. In an &lit, the WHOLE clue must present a plausible definition, and the WHOLE clue must be the wordplay as well. In this case the definition isn't even close (just imagine it as a "straight" clue - would it work?). From a wordplay perspective "making them" plays no role, so no &lit. I'd love to know how much the Canberra Times pays for this crossword. Not very much, I bet. Yeah, I tend to agree with you about the quality of the Gemini cryptic. And 17 Across. Sigh.